As a leader, you are expected to be the shepherd of your team or company. You must guide your employees, stand as a symbol of strength for your team, and direct the day-to-day operations, all while managing change and keeping an eye to the future. It's a great responsibility for any individual. However, if you are battling the inner demon of low self-esteem, your leadership duties become an even bigger obstacle to reaching your goals. Learn how to create a breakthrough culture in your organization with Rapport Leadership. How Do I Build My Self-Esteem and Confidence? One of the most important aspects of building confidence is identifying where your low self-esteem comes from. Often times, even well-meaning parents can do damage to their child's self-esteem through their words and behaviors. When you have grown up hearing overtly negative talk, or your parent's involvement in your life (or lack thereof) left you with feelings of unworthiness or abandonment, these internalized beliefs will follow you into adulthood. As an adult, you'll need to combat those beliefs in order to improve your self-esteem and accomplish your career goals and your life's mission. Now, there is another possibility. If your self-esteem at your job is low because you aren't qualified or don't have the necessary training to accomplish your duties, some continuing education in leadership or your specific industry will often help. The best way to beat imposter syndrome is to equip yourself with tools and knowledge. Maybe you aren't entirely sure that what you're dealing with is low self-esteem. Morris Rosenberg is the premier researcher in the field of self-esteem. He discovered the following signs of low self-esteem. See if you've ever experienced any of the following symptoms and whether or not they've had the corresponding adverse effects. Sensitivity to Criticism - This is especially detrimental as a leader who must be able to take feedback without getting emotional in order to learn from his or her team. Social Withdrawal - A leader must be able to communicate with team members and must not shy away from social interaction. Hostility - A hostile leader will cause distrust, resentment, and general dissatisfaction among their employees. Excessive Preoccupation With Personal Problems - Whether you keep to yourself because of your personal problems or take them out on your employees, this will affect your relationship with your team. Physical Symptoms Such as Fatigue, Insomnia, and Headaches - These can cause excessive irritability or may cause you to miss work. Over time, they can lead to more serious diseases. There are other, more subtle symptoms of low self-esteem. Do you ever find yourself apologizing unnecessarily? Do you say "I'm sorry" when you've done nothing wrong? Are you extremely hard on yourself when you make a mistake? Are you hesitant to speak up in meetings, or do you speak too much? Are you extremely judgmental of others and quick to point out their faults? All of these are symptoms of self-esteem issues as well. On the Other Hand, What Does Being Confident Look Like? Now that we understand the signs of low self-esteem, how do we recognize confidence in others and in ourselves? When you’re confident, it’s apparent in your behavior. If you've identified that you do indeed have low self-esteem, there are a number of things you can do to improve it and love yourself. Make a list of the things that you like about yourself. Consider asking close family and friends for help with this exercise. What characteristics do they love about you? Take some time to write down what you've done in your life that you're proud of. For example, school or sports accomplishments when you were younger, raising a family, work promotions, or extra-curricular activities. There's truth behind the old saying "When you look good, you feel good." When you dress appropriately for your body and for your professional role and keep your hair and makeup (if desired) in style, you feel better about yourself. Eating right, exercising, sleeping... they all factor into how you feel about yourself and whether or not you feel capable of handling whatever comes your way. Studies have proven that lifting weights makes you more confident in other activities because you see the fruits of your labor as you grow muscle and increase weight and reps. When your thoughts start to wander down the rabbit hole of negativity, stop them in their tracks. Identify the negative thoughts, uncover their trigger, and then replace them with positive, life-affirming thoughts that boost your confidence. This will take some practice, but you'll get faster at identifying them, and you'll learn with triggers to avoid in your life. It's not enough to just write the mission statement. You must also align your behaviors with that statement. When you are acting within your core values and working toward your goals, your confidence will grow. Have you ever said anything to yourself that you wouldn't say to your worst enemy? Be kind to you and show yourself the compassion that you show others. Nothing makes you feel better than doing for others. Schedule some time to volunteer in the community or to help a loved one who needs assistance. While a lot of this work must be done internally, it's often helpful to have an outside observer who can help you identify the source of your low self-esteem and guide you to overcome it. Leadership and personal development organizations such as ours at Rapport Leadership International have personal development training programs that help you break through your blocks and embrace what makes you amazing. 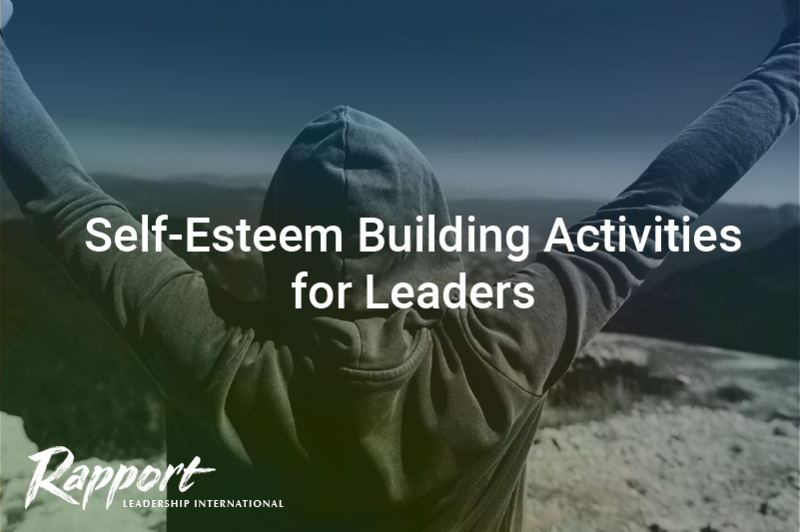 Low self-esteem can affect every aspect of your life from your personal relationships to your leadership abilities and your opportunities to get move up in your career. It's never too late to face your confidence challenges head-on and to get the help and do the work necessary to overcome them. Building your self-esteem is a life-long journey... so why not start today?